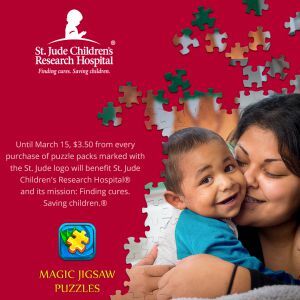 Home › Blog › Magic Jigsaw Puzzles Partners with St. Jude Children’s Research Hospital® to Help Suffering Children! Magic Jigsaw Puzzles Partners with St. Jude Children’s Research Hospital® to Help Suffering Children! Charity activities have always been crucial to ZiMAD and today we’re happy to announce that, for the second year in a row, we will partner with St. Jude Children’s Research Hospital®. St. Jude Children’s Research Hospital is leading the way the world understands, treats and defeats childhood cancer and other life-threatening diseases. Families never receive a bill from St. Jude for treatment, travel, housing or food – because all a family should worry about is helping their child live. Treatments invented at St. Jude have helped push the overall childhood cancer survival rate from 20 percent when St. Jude opened to more than 80 percent today. And St. Jude freely shares the discoveries it makes, and every child saved at St. Jude means doctors and scientists worldwide can use that knowledge to save thousands more children. St. Jude won’t stop until no child dies from cancer. Until March 15, 2018, $3.50 of every purchase from puzzle packs marked with the St. Jude logo will benefit St. Jude Children’s Research Hospital and its mission: Finding cures. Saving children.® Let’s support the hospital together.